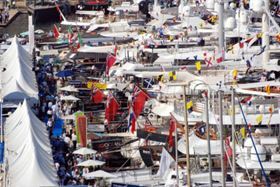 Around 500 exhibitors and 30 000 attendees are expected at this year's Monaco Yacht Show. SP - High Modulus offers boat builders composite technologies and engineering expertise. New marine products include Corecell™ M-Foam, which has been developed to deliver one foam product for all marine applications. It provides a combination of high shear strength, low weight and high elongation, low resin uptake for infusion processes and high-temperature stability for prepreg processes. Corecell M-Foam has recently been type-approved by Bureau Veritas and Registro Italinano Navale (RINA), adding to earlier accreditations from ABS Quality Evaluations Inc (ABS QE), Det Norske Veritas (DNV) and Germanischer Lloyd (GL). SP - High Modulus will also promote its Spabond 540 high-performance marine adhesive which is designed for bonding large polyester and epoxy composite structures. It has extended working times, exceptional toughness and high strength, and can be used to bond stringers/bulkheads, frames and hull-to-deck joints on medium to large production boats. The Monaco Yacht Show 2010, a trade show focusing on the luxury yachting sector, takes place on 22-25 September in Port Hercules, Monaco. SP - High Modulus will exhibit in the Darse Sud Tent, on stand QS70. Composite materials combining properties of both flexibility and stiffness.